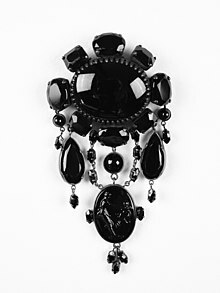 Mourning jewellery: Jet brooch, 19th century. Jet is a geological material considered to be a minor gemstone. It is originally a wood product called lignite, squeezed and heated by geological processes. The older definition of mineral did not apply to organic material. Therefore, jet was not called a mineral, but instead a mineraloid. However, this view is changing, as so many crystalline materials have organic origin. The English noun "jet" comes from the French word for the same material: jaiet. Jet is either black or dark brown, but may contain pyrite inclusions, which are of brassy colour and metallic lustre. The adjective jet-black, meaning as dark a black as possible, comes from this material. ↑ Oxford English Dictionary 1989. 2nd ed, Oxford University Press. This page was last changed on 25 July 2016, at 12:21.